We love anything that has an inclination to nature! No wonder many homeowners look for a way to add plants in their house. Did you know that there are actually more than one ways to do that? Yes! There are indeed so many ways to add plants inside your home. This includes bringing in plants in pots while others allocated a certain area in their home which they call an indoor garden. Some would even utilize the space under the stairs as a garden. Another good way to do that is creating a green wall or a vertical garden. You may wonder how this looks like. But you don’t need to ask Google about a green wall because today, we are going to show you a home that has green walls in it. And mind you, it looks really awesome! 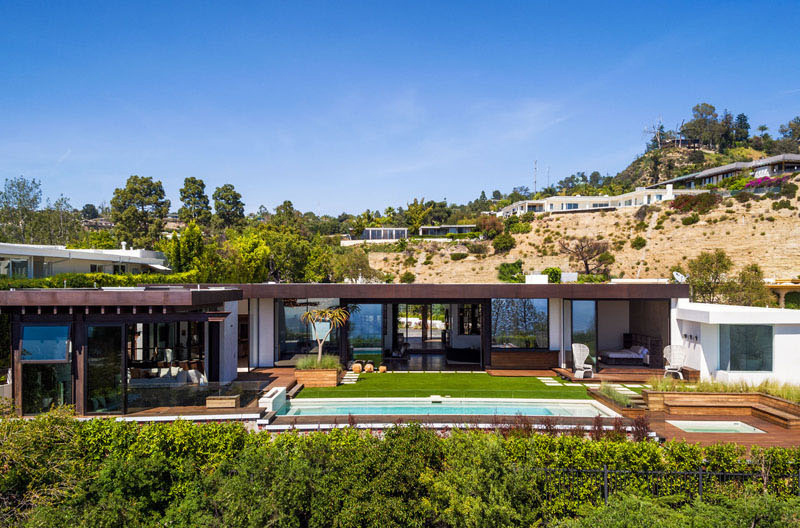 Let us take a look at the Trousdale Residence below. Unique feature: This home has many impressive features including a green wall, a stunning entry and a pool with wooden decking! 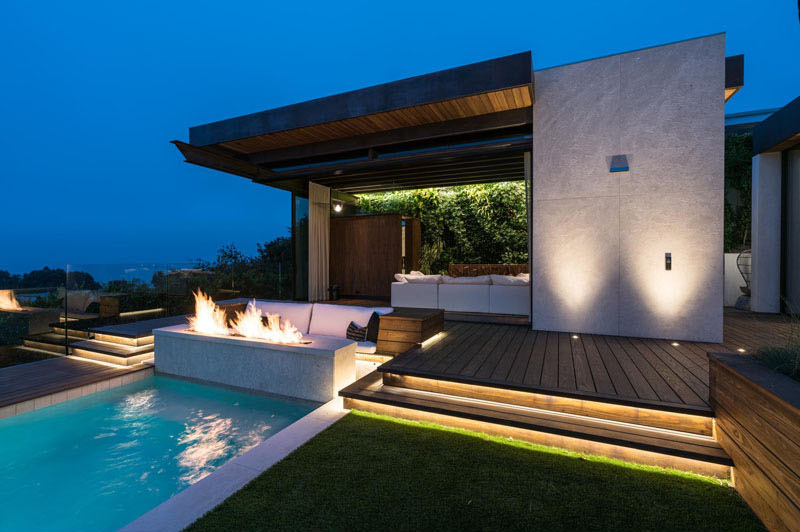 Design firm Mayes Office completed this modern house located at the top of Beverly Hills. This one-storey home is very beautiful both outdoors and indoors! 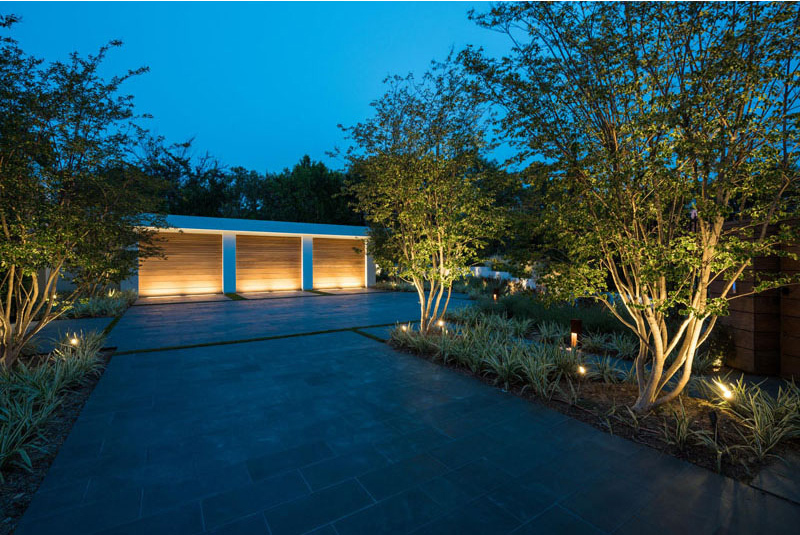 Guests are greeted by up lighting in this area which highlights the landscaping and the garage. The landscaping of the house is one good feature. Guests will cross a solid limestone bridge that’s suspended over a reflecting pool. The custom pivot front door has a beautiful unique design. It is made from acid wash copper finish and it floats inside a frameless glass facade. 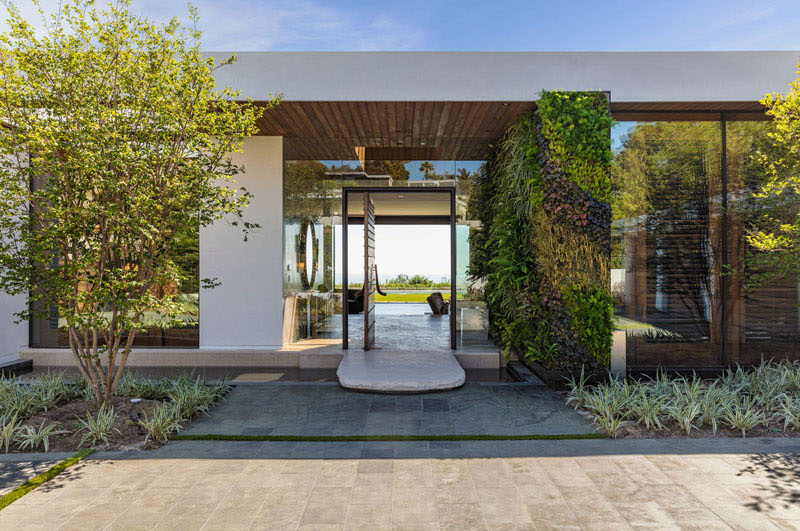 A 14-foot high green wall starts on the exterior of the house and travels through to the foyer. The pictures show the entrance of the house outdoors and indoors. 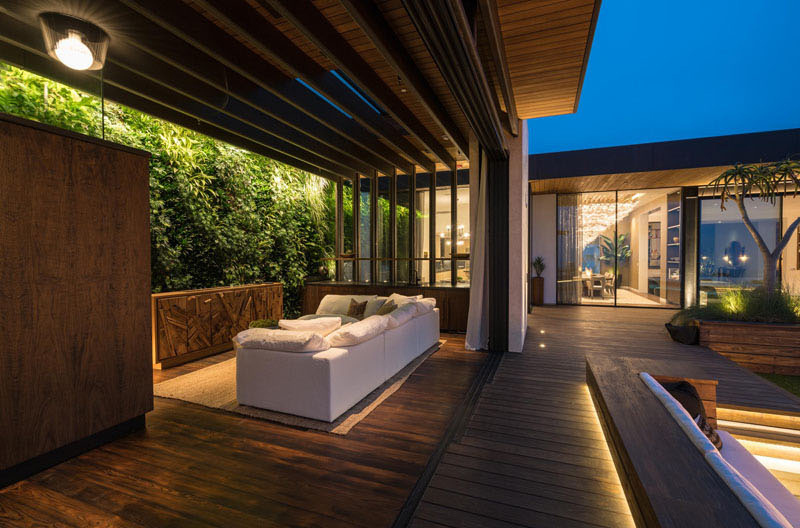 Notice that the green wall continues inside the home while the outdoor part has a path that floats above the water feature. Such a beauty indeed! For sure, you will take out your phones for a selfie if you are in this foyer. This really looks like a space located in a hotel! Just look at the wooden ceiling, the concrete bench, the green wall and the round mirror! Even the wooden door is a beauty! Take a look at different ways to light up your foyer so you can welcome guests with a bang! The living area use different designs for the furniture which gives it an eclectic appeal. Notice also that neutral colors are being used here. 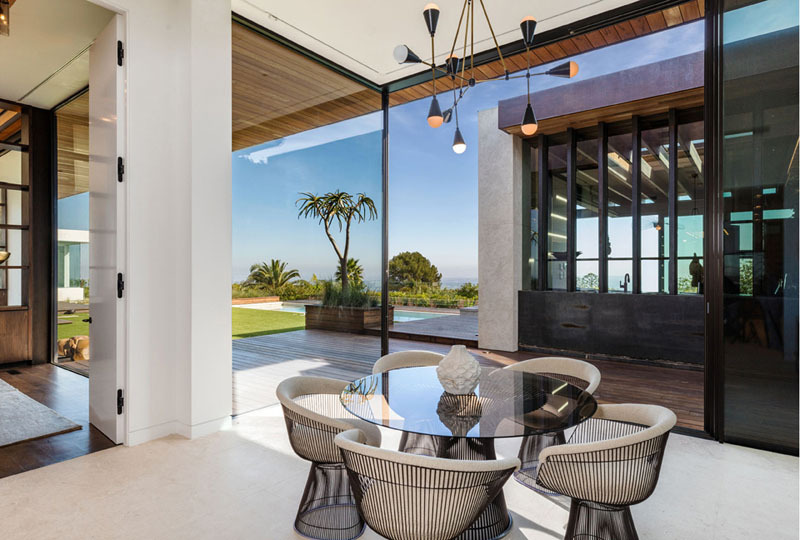 Large floor-to-ceiling windows are used in the dining room. It provides views of the backyard and adds plenty of natural light to the space. Isn’t this an airy and bright space to unwind? And look at the views from the area! Cantilevered beams are used in this gazebo which helps it to be sturdy and free of walls. It used wooden flooring too which connects to the outdoor space. At one end of the pool is a sunken lounge with a fireplace. There is also a pool house that consists of a series of cantilevered steel frames. 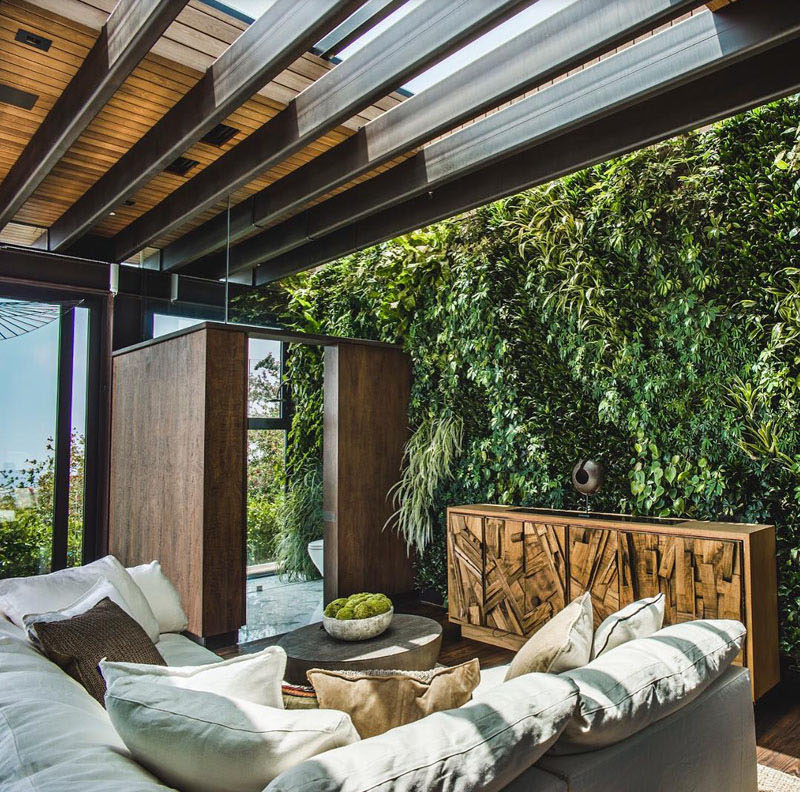 The green wall provides a natural element to the space. The gazebo also has skylights above it that allow natural light. The rear of the home has been split up into various multi-level areas which includes a pool house, swimming pool, lawn and sunken hot tub. Isn’t this is a very inviting space? 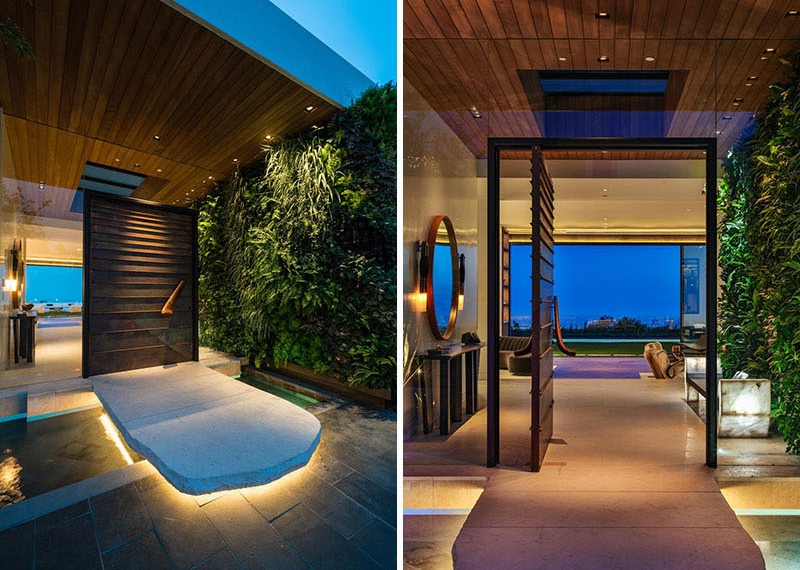 The lights add beauty both to the interior of the house and the outdoor space. This is how the interior of the gazebo looks like. Aside from the green wall, it has a shower room and toilet which is specially designed for those who are from the pool area. Aside from its outdoor pool, the house also features hardscapes with wooden decking around the pool. There are also planters around it which makes it look stunning. 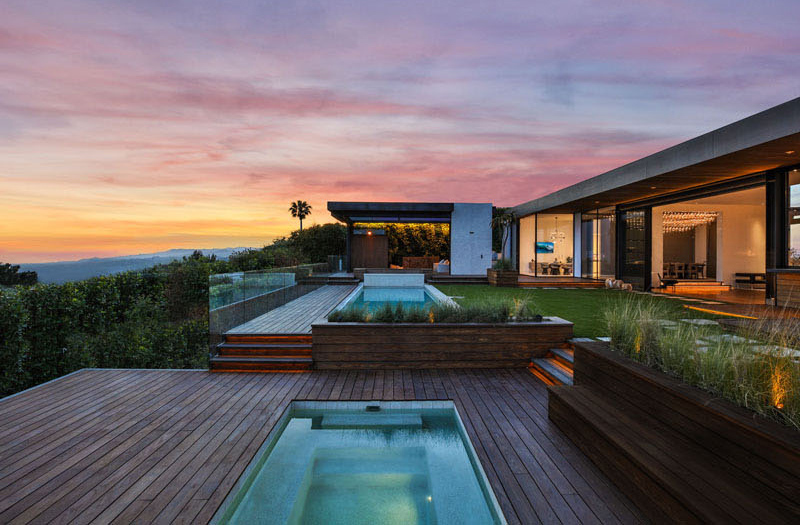 In this image you can see how the house looks like entirely including the pool and the landscape. I totally love the landscaping of this modern home. It doesn’t look too much but it is really beautiful! This project is from Mayes Office which is actually a renovation and extension at the same time. The main objective was to create a new experience and aesthetic for the existing home without changing the structural integrity of the building. The interior were opened visually and physically to the exterior landscaping areas. 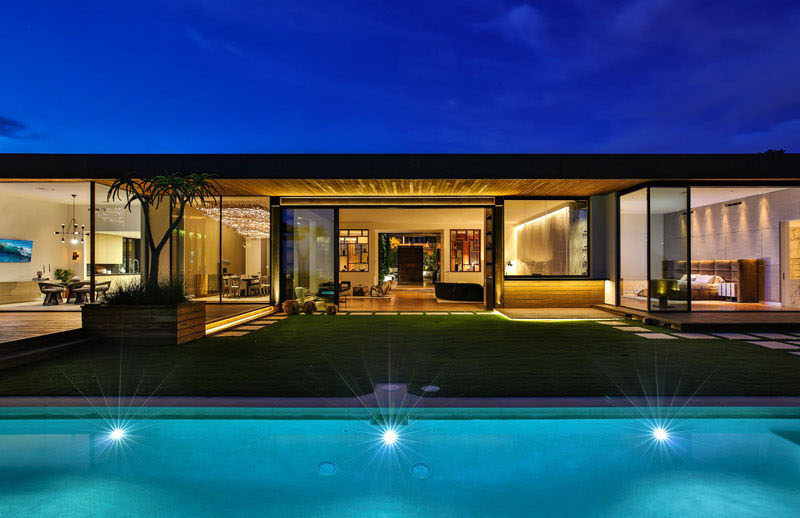 To complete the overall composition of the house, a detached pool with hardscape features was added. This home looks really nice even if it is only a one-storey house. This shows us that you don’t need to build a towering house in order to make it look grand and beautiful. It really is just a matter of design!